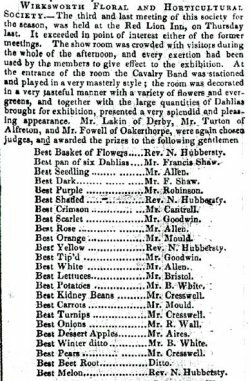 I was transcribing some Pentrich related material from some photocopies of old Derby Mercury newspapers, and came across an 1834 Wirksworth related extract, which I have transcribed for you. I thought you may like to post it on your web site somewhere? Most kind Helen, here it is, with links to the 1841 Census (only 7 years later). by the members to give effect to the exhibition.